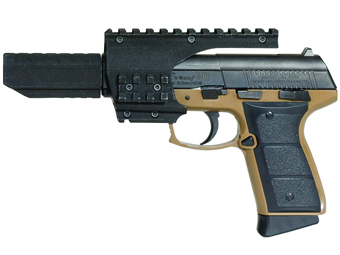 Daisy's PowerLine Model 5502 is a CO2 pistol with semi-auto blow-back action which includes upper, lower and side rails for mounting sights and other accessories (other accessories not included). Load the 15 shot clip, drop in one of Daisy's 12 gram CO2 cylinders and you’re ready for hours of target practice and marksmanship training. Daisy’s PowerLine Model 5502 pistol is appropriate for adults and those ages 16 and older with adult supervision. Max. Muzzle Velocity: 430 fps.